Plant-based milks of all varieties are becoming more and more prominent on the shelf as people move away from dairy. Whether it’s due to an intolerance, an aversion to all things dairy or just some variety; the options are so much greater than good old UHT soy! The best bit, all of these milks are ridiculously easy to make and will give you a delicious product that doesn’t have the additives. With two hands to tick off ingredients and steps, we suddenly have ourselves one of the easiest recipe’s I have ever followed. 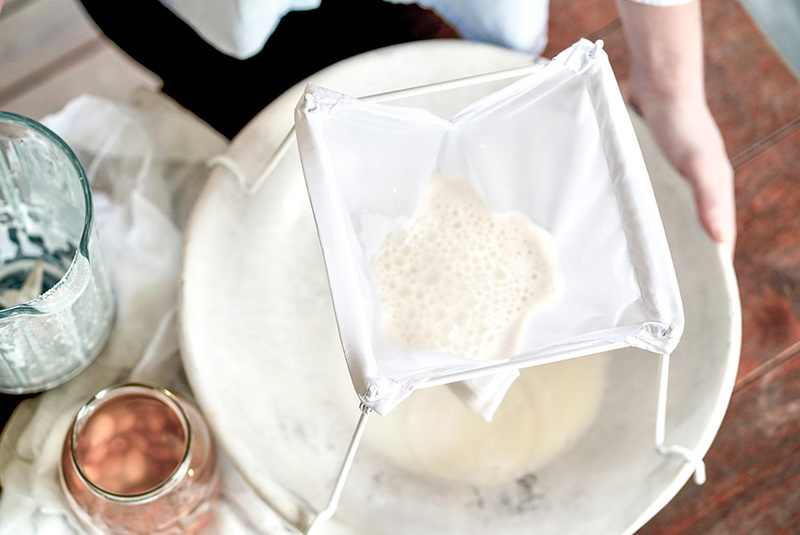 - Nut milk bag for draining (we have the perfect nut milk bag for this as it has an adjustable stand, so it fits nicely on top of all sized pots and bowls without having to tie the bag to a tap or somewhere else to keep the bag out of the milk. Plus, some organisation the day before. And when I say organisation, I mean buy the nuts/soybeans and put them in the water. Soak nuts overnight in the fridge, use enough water that they are completely covered. Rinse and drain the nuts using the nut bag. Put the nuts into the blender with 3 x the amount of water e.g. 1 cup of nuts will need 3 cups of water. Blend until smooth, this will take about 2-3 minutes depending on your blender. Pour the mixture into your nut bag with a jug/bowl underneath to catch the milk. Add an extra 1/2 cup of water to the blender and blend for 10 seconds to collect all the nuts, pour this into the nut bag. Give the bag a good squeeze to ensure you get all the goodness out of it. Voila! Just like that, you have nut milk. The hardest part is choosing which type of milk to make and then how creative you want to get with it. - The amount of water you add is up to you. More will be a thinner milk, less will be creamier. A second blend of the pulp from the nut milk bag + 1 cup of water can also be done. This will make sure you get out ALL the goodness. 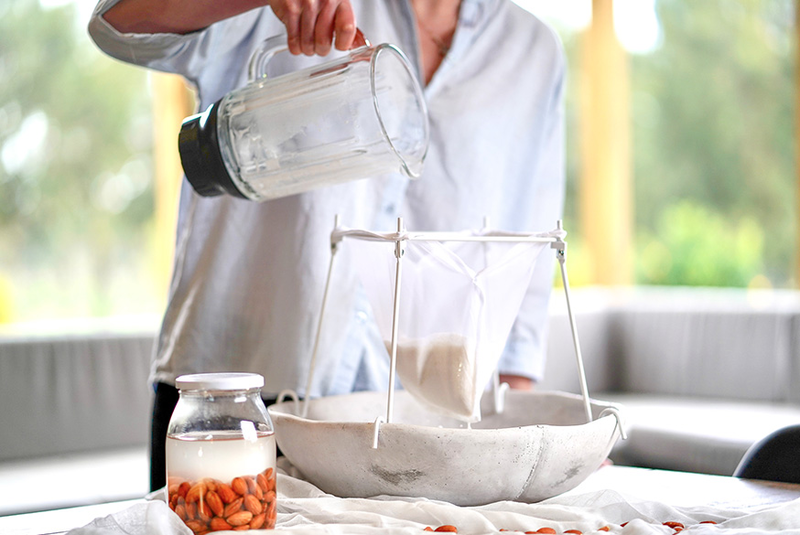 - The nut milk will separate when left sitting in the fridge as it’s a natural product with no additives, give it a good stir or shake before using. - Only keep in the fridge for 3-4 days, then make up a fresh batch. - You don’t need to remove the skins (except for hazelnuts), these will be filtered out by the nut bag. - Cashews are the easiest to start with, sometimes it helps get the creative juices flowing when you have success with your first batch. Might as well start on a high! 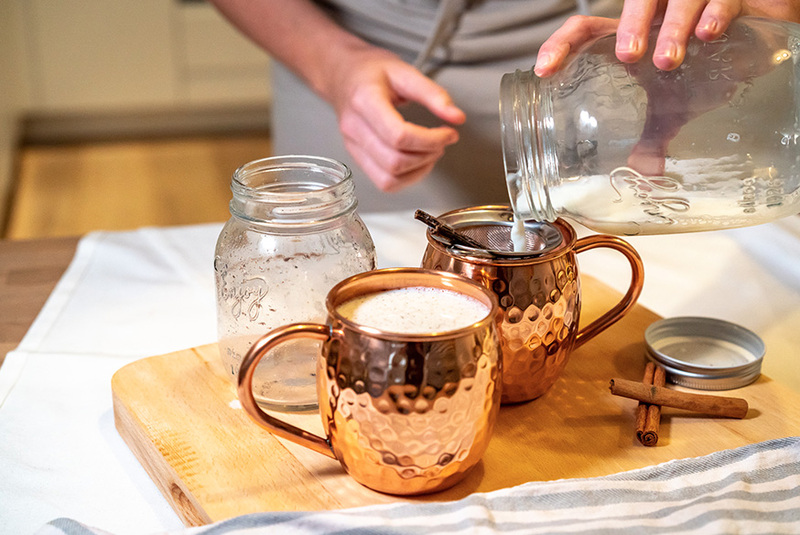 On a creative note, you can add just about anything to your nut milk to spice things up. Below is a recipe we tried out – it was delicious. - 1 x vanilla pod, seeds scraped out – if you don’t have one substitute for ½ teaspoon of pure vanilla extract. Pour the milk into a jar and add all the other ingredients. Shake until everything is combined, this may take a little bit of effort with the honey. Pour into cups, if you prefer it cold, serve at this point. We decided to try it hot so put it in the Nespresso milk warmer, a pot on low heat or a minute or 2 in the microwave will have the same effect.